Praya Mam, DPM, is one of the many board-certified Podiatric Physicians on staff at American Foot & Leg Specialists. Dr. Mam is a Diplomate of the American Board of Foot & Ankle Surgery, a member of the American Podiatric Medical Association, and a Fellow of the American College of Foot and Ankle Surgeons. 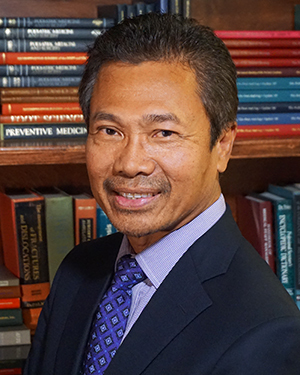 Dr. Mam began his education with a bachelor’s degree from the University of West Florida before receiving his medical degree from the Ohio College of Podiatric Medicine. Dr. Mam’s postgraduate training included a medical and surgical residency at Cleveland Foot and Ankle Clinic in Cleveland, Ohio. Dr. Mam has been in practice with American Foot & Leg Specialists since 1994. He is currently on staff at Piedmont Henry and Atlanta Medical Center. Dr. Praya Mam is one of the dedicated board-certified podiatrist physicians at American Foot & Leg Specialists. He is a patient and professional doctor who will thoroughly examine you and make a skilled diagnosis. If you are looking for a caring, committed foot doctor, call us today and make an appointment. You can be confident that you will be well taken care of by Dr. Mam and the other physicians at American Foot & Leg. Our offices serve patients in the South Atlanta area including the cities of East Point, Forest Park, Locust Grove, Griffin, and Jonesboro.